I remember my first fan of DDTTRH was my wife, Claudia. That will always be special to me. I was happy too when I found early committed fans (like Anitra and Jason) who were willing to give of their time for the cause. After Anitra and Jason there were Kandice, Josie and Christian. I don't want to forget to mention Jake as well who has helped us in our most recent past with Youtube videos. The other thing we felt we needed was a Rock Hall Liaison. This would be someone who hopefully had connections with the Rock Hall that could reach out to committee members and let them know about us. Someone volunteered for that position. She started off fabulous. In fact, given that we were doing research on Duran Duran (mainly on bands that were influenced by them and where Duran Duran was mentioned in media), we needed someone to write up something about how Duran Duran has been involved with community service. She did an amazing job on a writeup to this effect. You can see it at our website under the Duran Duran--Community Service link. The next thing I was working on with her was a letter which we would present to various persons on the Rock Hall committee letting them know about us. We went through a draft and a final version, but nothing went farther. It got so bad the not hearing from her, that after repeatedly reaching out to her and not hearing from her, the rest of the staff and myself decided to let her go. I found out later that she had taken an extra job and had no time to help out. To this day I wish she had just said something instead of just not communicating. I still have that letter by the way--any volunteers to send it out to people on the Rock Hall committee? Then there was what happened with Nabeel. He had a serious car accident. He was hit by a UPS truck and from talking with him, I believe it damaged him extensively. I had conversations with him after his accident and I could tell how down of spirits he was. Then there was a point where I didn't hear from him again. Others of the staff were concerned about him and also tried to reach out, but nobody heard anything back. To this day we don't know what happened with Nabeel. He will always have an important place as part of the history of the DDTTRH effort...particularly in giving us our first amazing logo. We let Nabeel go after not hearing from him for a long period of time. There were other challenges too. I had one guy who was interested in helping to be our Blogging Specialist. I trained him and everything. Then, I remember there being floods in his area and he told me he no longer had time to help (which is fine--I was happy he at least said something). I tried to get someone else in his place, and there was a promising candidate to do it, but that petered out quickly. Then there was the matter of trying to call City, Country Representatives. One of them we called and I was hoping they'd be more 'asking us what they can do' vs. us 'telling them what to do'. We also needed help to translate our blogs to different languages. Several signed on and when I gave them work to do, nothing came back. There was someone (Mr. Mystere we call him) that was very helpful with French translations...but he was an exception to the norm. Another exception was Radio Creme Brulee--we were excited when Pranav (who owns it) reached out to us and was willing to represent Chicago. I actually met Pranav in Chicago when I was on a business trip. We had a great chat on ideas of how to promote the effort. It led to our first Youtube promotion which so far has been fairly a success. In fact, it was thanks to that discussion that I had the courage to reach out to Katy who works with Duran Duran who gave us signed posters (and she was very happy to do it). Pranav has not been able to help us as much as he wants too...but something I appreciate about Pranav is that he has told me upfront how busy he is and while he wishes he could do more, he does what he can. This is really all we wanted from people, and still do. If they can't help, don't say they can and then quit. If they start and can't help, let us know, please be upfront with us instead of not communicating straight up with us. We understand that everyone has lives and is busy. If you want to help, great, give in what little ways you can...we would appreciate that. But just 'don't give' because you think you're being inconvenient to us or know you can't give more than you think we expect. What I'm trying to say is that any little effort you do is appreciated, because all the little efforts eventually will add up to something great. You might ask why this is important to blog about? One of the reasons that has caused rifts and problems in our group is essentially this...the lackluster or 'lack-of-follow-through' commitment of some of the fans to DDTTRH. We even had one representative, who was to represent us in California. He said he had connections with some famous people and it was thanks to him that we received an email of support from a friend of the band's. Then, he had offered to present shirts to the band with special messages to the band on our behalf. I was less disappointed about him falling through on the t-shirts than I was with the dropping off from committing the support (or at least being upfront with me on reasons why). I actually enjoyed my conversations with him and I was looking forward to somewhat of a friendship...but I've tried and tried to reach out to him and its as if no one is there. And the other thing that was troublesome was when I asked Kandice if she could help with the representatives and when she reached out to him and others, she was not contacted back. It was almost as if they felt as they were being treated 'less' because I was having another valued member of our staff contact them. I never understood this and don't to this day. 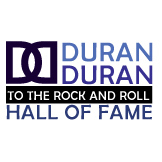 Or perhaps you are of the camp that since a couple of members of Duran Duran have said they don't like the Rock Hall (though haven't said explicitly that they would not accept nomination [:--had to put that in there), that we should just do nothing to raise awareness about the band. It doesn't matter to you that the band's friends and many other have shown support for DDTTRH. You of all people should know that the band avoids trying to be recognized for the great contributions they've done for the music industry. I believe that if they were nominated, they would be gracious about it. I mean--if they were totally against the Rock Hall (which I believe they're not), why would they donate historical pieces to them? Did you know they did that? You don't have to go very far in the fan community before you meet someone who 'wants a piece' of Simon, Roger, Nick, or John. I mean, who wouldn't? DDTTRH is different than this...it gives you an opportunity...different than any fan group out there...the opportunity to give back to the band that has meant so to all of us...thats what its always been about. Take away everything else...the imperfections of the people serving in DDTTRH...the structures and organization...the promotions...the 'Rock Hall' in our name....whats left is its sole mission. We seek to raise awareness of a band that had made history and continues to do so. Learn about other unique challenges that we've had at DDTTRH. Some of them, I admit I unintentionally caused...some I admit I have no idea on earth why they happened, or why they were a source of such contention. The next blog will also set the stage for the blog about 'The Epiphany' and why that was so important to DDTTRH and changing who we are. I don't know how many blogs it will take, but it doesn't matter really. Things need to be said and I am the one at DDTTRH, besides Christian, that is left to say them. In the end, I'm hoping you will all see what DDTTRH is really all about and will be willing to join with us (whether here or at DDWW) as we romote Duran Duran. I started out DDTTRH for one main, innocent reason...to give homage to a band that has truly blessed my life with the gift of their music. Though some may question it, I have listened religiously to Duran Duran ever since the first time I purchased their Seven and the Ragged Tiger album. And the story I told of when I shared their music to my parents in the car, and my Dad said to my Mom..."listen honey, this is alternative music" is absolutely true and will always be a fond memory of mine. I knew then as I know now that Duran Duran's music is special. Its unique and different. And it disappoints me sometimes when Simon says that they are the ultimate party band...almost saying that their music is 'just party music', when to me its so much more. Their music has transported me to places I could never go to in my life and given me an art form to appreciate that I have and continue to appreciate as it is released. And I will be honest and say that I only went to my first Duran Duran concert last year. It was an amazing moment in my life, one I will never forget. And it was me that was outside the venue where it took place passing out fliers for people to sign the Rock Hall petition. I was grateful of Maria Sbrocco as well who helped me that day...in the rain. What a great example of a fan that truly saw what DDTTRH was about and who, through her honest efforts, believed and did something for the band that meant so much to her. How exciting it was that day as well to have the press involved and have them film me doing something good for the band. I will say though that I was disappointed that they angled the story as if I was the only one doing it and was a bit of a 'crazy' fan...the press will find ways to do that I suppose. No matter...I am proud to say that I am a Duranie and am not ashamed of it. Since we started this effort, DDTTRH, it hasn't been an easy road. There were two that came on and believed in what this effort stood for...Jason and Anitra. Jason, for family and time reasons could not stay with us, but is still to this day one of our supporters. Anitra has done amazing things to jump-start the effort...interviewing bands and artists that were excited to speak up for the band...artists excited for the chance to do so. Kandice joined later, along with Josie. Both of these ladies have done and did amazing things for DDTTRH. Kandice...our Petition Duchess...who tirelessly reached out to fans to sign the petition and followed up with every interview Anitra did to make sure they signed and told their friends. When Kandice left, it was a hard day for me. She recently sent me a binder with all the work she did. It was a very thick binder too! As I went through it, I imagined her working hard on something because she believed in it...and her commitment was palpable in those pages. This was one of the reasons she was given a leadership title with DDTTRH...because she was so committed and dedicated. She could always be counted on...no matter where help was needed. And Josie has done amazing work for us too. Always willing to edit something that went out, so we wouldn't be embarrassed with our bad English. Josie to me represents that quiet, yet always there kind-of-person who is honest about what she can do and will give where she can...and is willing to 'do anything for the boys' as she says to me. If only there were more Josies out there. If only there were. And that leads me to Christian. If it wasn't for Christian, we wouldn't have the amazing websites we do today...for both DDTTRH and DDWW. When I first met Christian I think we argued about a post he did on Madonna. I remember taking down his post because it was offensive and I remember telling him that we needed to be careful about how we spoke of other artists on the site. And I never told him this, but in my mind back then I was imagining Madonna, who is likely on the committee choosing artists for induction, actually seeing that post and getting angry about it. I was probably being silly, I know, but back then I was a different person than today...before the Epiphany happened (after my first Duran concert) and before I had formed a relationship with Anitra, Kandice, and Christian. Learn more about the challenges we've faced at DDTTRH and things I learned from 'The Epiphany'. The next blog will also be a set up to the important things I learned about different kinds of Duranie fans out there and the bitter-sweet experiences that came to light because of those experiences with them.